When we were planning the renovation of my new apartment we set a timeline of 8 to 10 weeks from demolition to sufficient completion to move in comfortably. Demolition started on 10 June and I moved in on 10 August - nine weeks. How's that? 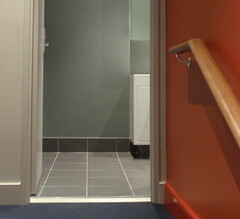 A renovation completed on schedule. Admittedly, all the work was internal, so there were no delays or hold-ups for weather. But the work was quite extensive, with a new kitchen, bathroom, flooring, painting, and lots of work for the cabinet-makers. So, it was on time. Was it on budget? Hmmm...except for two additions to the original brief that I requested, it's cost exactly what I was quoted. Admittedly, the original quote was significantly more than I had hoped to pay, but the final figure has not increased. I take no credit for any of this. It's all due to Heather. 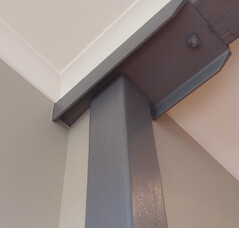 Everybody undertaking a renovation really needs a Heather - a designer and project manager who, as well as assisting with design advice, provides expertise and contacts so that tradespeople are competent and their work is well-planned and scheduled and, most importantly, thoroughly quality checked. 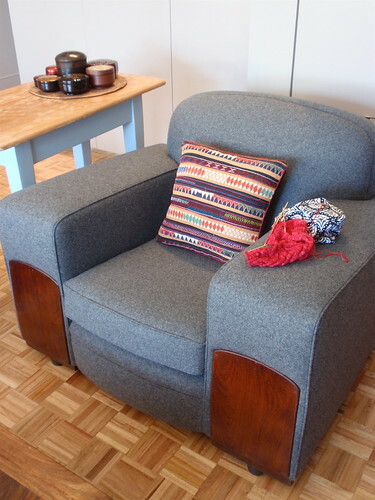 One of my additional requests was to have my old lounge suite (to use a rather old-fashioned term) reupholstered. I dithered for ages about whether to do this. I could have bought a new, reasonable quality sofa and some chairs for what the reupholstery cost. 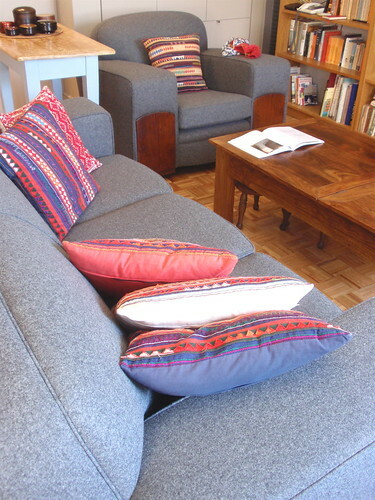 But my old sofa and chairs were so comfortable in a way no modern sofas are. Heather says this is partly because they are structured with springs, which gives them resistance when you sit in them. I like sitting on chairs, rather than sinking into them, so this old-fashioned structure suits me well. I've had them covered in grey flannel. I couldn't be happier with the outcome. They're very tailored and sleek. A little bit 'Mad Men' - though my cushions rather undermine that slick effect. From my point of view the only good thing about Saturday evening and the interminable and distressing election coverage was that I made significant progress on my current Personal Sock Club socks. 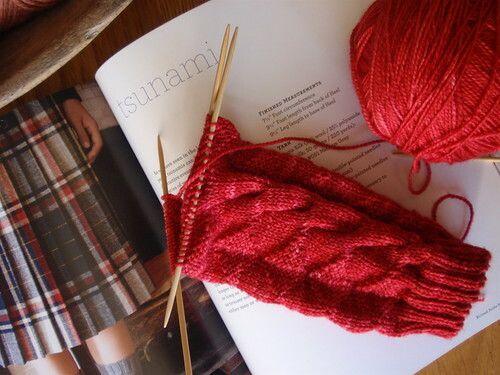 It's the Tsunami pattern from Judy Sumner's Knitting Socks East and West. I like the way the reverse stocking stitch diamonds create shadows, and, when combined with the distantly spaced largish cables, give an impression of folds and creases. Like origami creases. I'm knitting these on 2.75m bamboo dpns and hoping the slightly larger needles are sufficient to compensate for the way the cables will pull in the socks. The yarn is lovely madelinetosh in Scarlet. I am so behind with this pair of socks. My self-imposed deadline for these is 27 August - only four days away. I've no hope of finishing them in time, but watching the election did at least enable me to make a start. 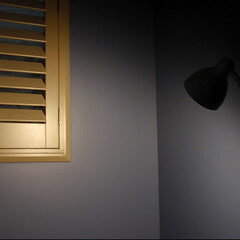 After a week and a bit, I finally have both the telephone and internet connected to my new apartment. Even though I've had access to the internet at work, I've been surprised by how much I've missed pottering around on the net at home. I'm settling in, but have still not finished unpacking. I'm on the verge of being depressed by the chaos, so I've set myself a deadline of the end of the weekend to finish. I think I hadn't anticipated that moving is hard physical work and that I'd find it as tiring as I have. Anyway, in a few days I'll have it all done...then some pictures. 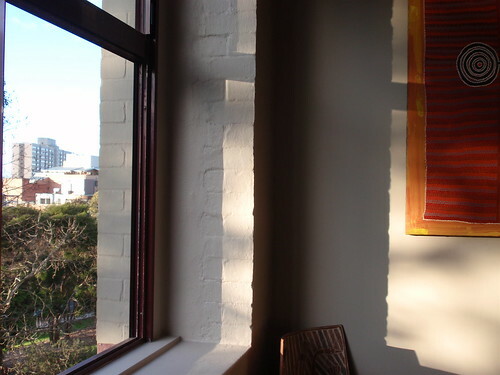 In the meantime, among many other things to enjoy, I love the morning light that streams through the large east-facing windows. Now, to create enough order to sit and enjoy it. The removalists came on Tuesday and moved everything I'd packed - mostly to my new apartment, and some of it to storage till I summon the energy to send it to my daughter in Brisbane. I hadn't quite finished packing everything before the removalists arrived and so I've had quite a few trips between my old and new apartment with a shopping trolley crammed with stuff. But I've really and truly moved! So many loads to the garbage skips in my building's basement; so many trips to leave things at the local charity stores; but there's still a mountain of boxes to be unpacked. The painters are in my new apartment this morning painting the old bookcases I've brought with me, so after they're dry I can begin unpacking all my books. Boxes of them. Many heavy boxes of them. Despite culling quite a few as I packed I think I'll still have too many for the space I have, so I suspect more culling will be needed. I'm torn between putting things away anywhere just to make some space, and knowing that this is a really stupid move. Anyway, I'm so physically tired that just co-existing with chaos for a few days seems by far the most attractive option. Predictably, I have no telephone or internet connection at home until sometime next week, so I'm having a bit of a holiday from blogging and blog-reading. Maybe next post I'll be more settled. I have three sleeps and two days until I move house. I've given things away, thrown out things that aren't worth recycling, and still seem to have so much to pack. At this stage I can't imagine getting everything done by the time the removalists arrive on Tuesday; but I know it just has to be done. 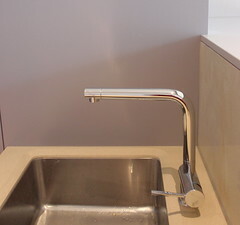 Except for some finishing touches - the coloured glass splash-backs above the kitchen and laundry benchtops; some drawer pulls that need replacing; a towel rail that needs attaching - the renovation is done. The bathroom and kitchen are functional, and my washing machine and dryer have already migrated to the new apartment. I'm very happy with the colours and finishes and am desperately hoping that all the new cupboards will prove sufficient for the stuff that's currently overwhelming me as I pack it all up. I've had something of a blogging block over the last week and a bit - or maybe I'm just too distracted and too busy and too tired. But I do want to write a bit more about my road trip in Victoria, before it totally falls off the edge of my memory. I've already written about the goldfield affluence and civic pride that created so many of the beautiful central Victorian country towns and cities. But there are always many ways to construct history, and the mid to late nineteenth century in rural Victoria was as much about insurrection as it was about civic achievement. We visited the Eureka Centre in Ballarat - a museum constructed near the site on which the Eureka Stockade was erected in December 1854. All Australian children learn at primary school that the Eureka Rebellion signaled the birth of democracy in the Australian colonies. Of course this is a simplification, but the stand of 150 miners against the Government's collection of steep mining license fees was about something more than self-interest. A broad movement for reform preceded the rebellion, often influenced by the Chartists in Britain and revolutionary movements in Europe, which demanded some form of broader representation in the country's decision-making. Perhaps ironically, the aftermath of the rebellion was support from the broader community, reduction in the license fees and a failure of the legal system to convict any of the rebels of the high treason with which they were charged. Peter Lalor, the leader of the rebels, became a politician and speaker of the Victorian Legislative Assembly. Even though the rebels at the Eureka Stockade came from a range of birth countries (including Australia), notably, none were Chinese. The history of Chinese miners on the Australian goldfields is troubling and disturbing. I grew up near the town of Young in New South Wales, and have always been aware of the brutal attacks on Chinese miners at Lambing Flat, just outside Young, but until I visited the small Chinese Museum in BeechworthI'd never heard of the 1857 Buckland Riots, in which Chinese miners were driven from the goldfields near Beechworth and their property destroyed. 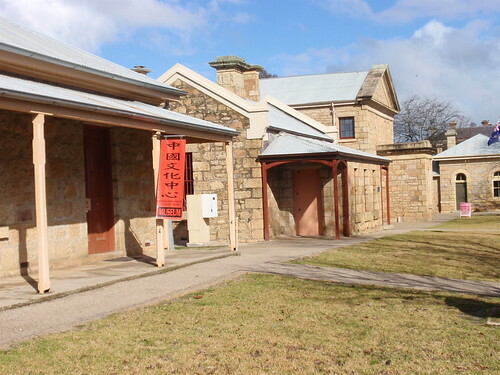 Despite such violent confrontations, it's claimed that at the peak of the gold rush, more than 5,000 Chinese miners lived in the Beechworth area and developed their own market gardens, shops and temple. I don't know enough to know whether such community separation was enforced, or undertaken voluntarily, or whether such distinctions were possible at that time. 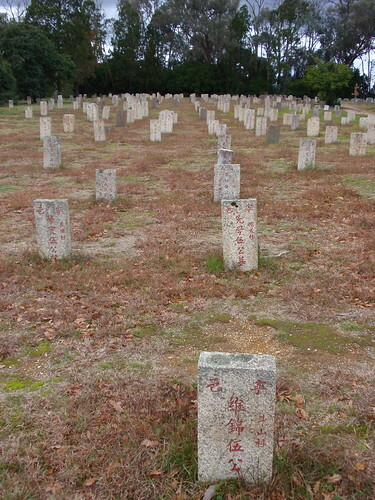 The cemetery at Beechworth has a moving memorial to the Chinese miners with a field of headstones and 'burning towers' used for ceremonial purposes. But there is no Chinese presence in Beechworth today. I can't help but wonder what happened to all the miners and descendants of the miners who were in central Victoria in the mid nineteenth century. No story of insurrection in Australia would be complete without a mention of Ned Kelly. North-east Victoria is self-proclaimed 'Kelly Country' and we found reminders of his presence in many places. In Chiltern we were informed that the first warrant for his arrest was issued in the Chiltern courthouse. In Beechworth we stayed in a motel next to a memorial celebrating a 20 round bare-knuckle fight in which nineteen year old Kelly had been the victor. Beechworth Gaol was where Ned's mother, Ellen Kelly, was sentenced to three years hard labour for the attempted murder of a policeman (Ned clearly came from feisty Irish stock), and Beechworth Courthouse was where Kelly's committal hearing was held in 1880. With all this history around us, we couldn't resist a visit to Glenrowan, site of the Kelly gang's infamously bloody stand against the Victoran troopers. The main street of the small town of Glenrowan is crammed with tatty souvenirs and garish 'experiences' for the tourist. But if you cross the railway line behind the main street you come to a small park and vacant block of land which is the location of the confrontation. Here, assistance for the tourist is more subtle and there are plaques describing the stages of the siege. 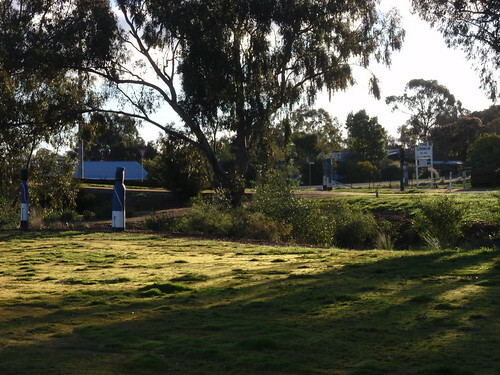 The white sign in the top right of the photo is the location of the Glenrowan pub where the Kelly gang held hostages and made their stand. The small gully in the centre of the photograph is where the troopers gathered and fired from. The scale is so small and the setting so ordinary for an event from which so many national myths have been constructed. I hadn't known that the troopers travelled by train to arrest Ned and his companions, and that they brought with them a contingent of reporters to observe and spread the news of an event that excited so much contemporary public interest. Perhaps an early example of the media being embedded with the troops? The reporters and general gawpers and observers took shelter in the tiny railway station, only about twenty meters from where the siege occurred. 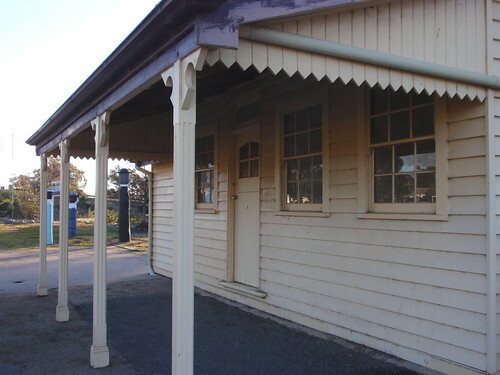 Unlike the Glenrowan pub, which was immediately burnt by the troopers after Ned Kelly was arrested, the station still stands and has been preserved in its simplicity. 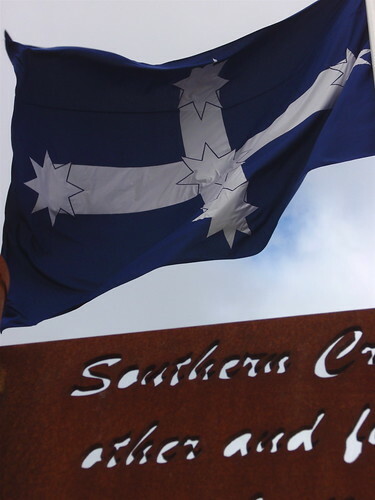 Victoria has a proud tradition of civic achievement, but the underside of that is the history of insurrection that is sometimes mythologised, and often forgotten in modern Australia. Ah well, such is life, as Ned is reputed to have said just before he was hanged.